While there is some variation among overall SUV size, many SUVs qualify as oversize or full-size vehicles. Such vehicles often weigh in excess of 5000 pounds, and also include larger tires, more durable suspensions, and elevated cabs. In addition, SUVs and trucks also include specialized bumper systems that are designed to resist impact forces with greater effectiveness. In the weight department, the larger size of most SUVs gives them advantages in collisions with smaller vehicles. In such situations, SUVs are more likely to survive with less damage to both vehicles and passengers. The elevated cabs are also an important factor during T-bone crashes. Cars that have lower centers of gravity can expose occupants to severe side impact forces. 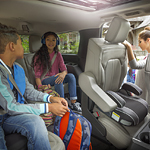 In contrast, many SUVs and trucks boost passenger seats several feet above the ground, and this puts the bodies of passengers and drivers out of harm's way during side impacts. Another specialized feature of SUVs are their reinforced bumper systems. Much like the cabs, SUV bumpers tend to be located several feet above the ground. During frontal or rear impacts, this feature can distribute crash forces evenly and further ensure passenger and driver safety.